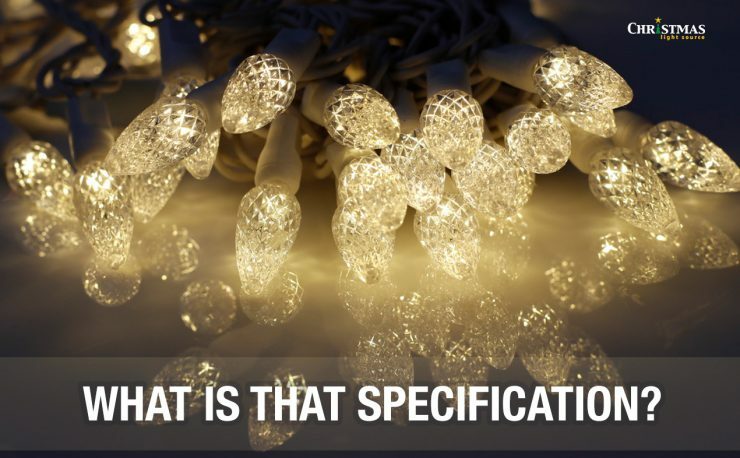 Making last-minute decisions about your Christmas lights? If one person writes to us with a question, we figure more people are probably wondering about the answer as well. These are all real customer questions! For many years, I’ve been looking at LED replacements for my traditional white mini string lights with white wires. I use them in our rec room along the ceiling and they put out wonderful warm, white light. I’ve not replaced them with LEDs yet because I’ve not found a close enough color match. Most “warm white” LED replacements have a greenish or pinkish color case that doesn’t look as good. 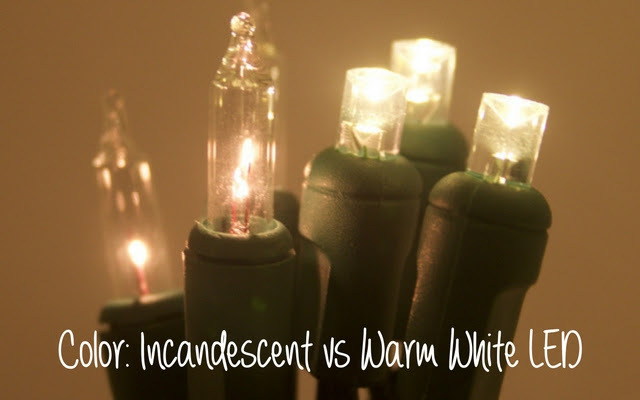 How close a match are your Wide Angle Warm White LED Christmas Lights White Wire lights? Thanks in advance. 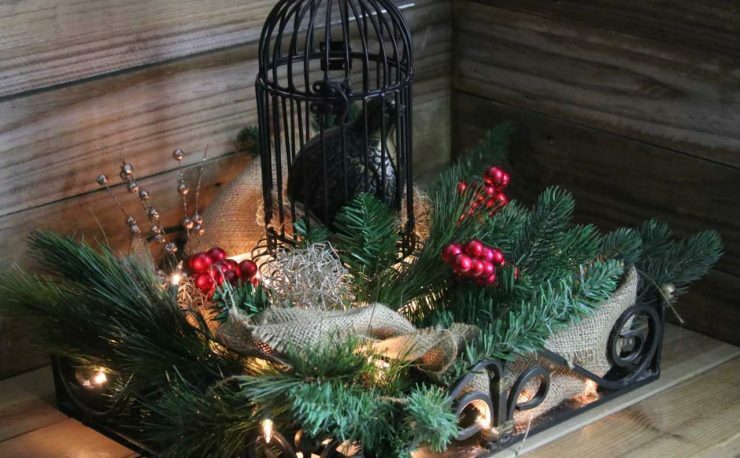 While nothing really matches the lovely warm glow of traditional (incandescent) mini lights, our warm white LED light strings seem to blend well with them when mixed together and are a nice alternative if you are interested in converting. With my eye, I see a slight yellow cast but no green or pink additions. You might also want to consider other lens shapes we manufacture in warm white — the 5mm bulb is very concentrated and, while it’s our number one selling shape, a more diffuse look provided by a textured lens cover might be a nice thing to consider for a cozy space like a basement. Above is a photo comparing 5mm (wide angle) warm white lights with clear (white) incandescent mini lights. How can I get the look of vintage lights? We’ll let one of our customer reviews answer this question. She was writing about our opaque C9 bulbs. Headline: Looks just like the old C9’s! Review: First of all, i didn’t just buy the blue bulbs, i also bought the red, white, green, and orange.. so this review is for all of the above. The bulbs are nice and bright (but not overly bright). 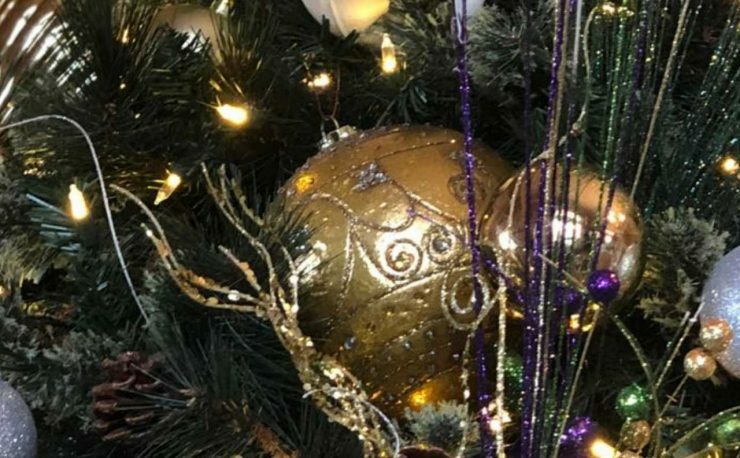 I have these on my Christmas tree and they look great! Before i installed them, i had some old vintage C9 bulbs that i had plugged in right beside these for comparison. They look identical. You absolutely can not tell the difference, so if you are going for the full vintage look, look no further. The only cosmetic difference i noticed was the metal base of the bulb, the old one’s are made of brass, and the new one’s are not. I have been using these for a week now with zero problems. I highly recommend them! 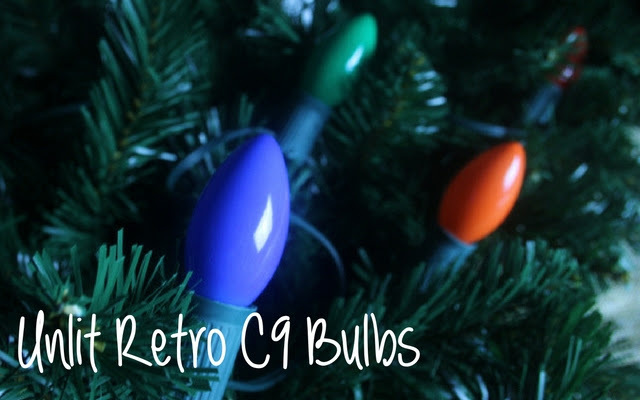 If you want to go LED with a Retro flair, try C9 LED Opaque Bulbs. 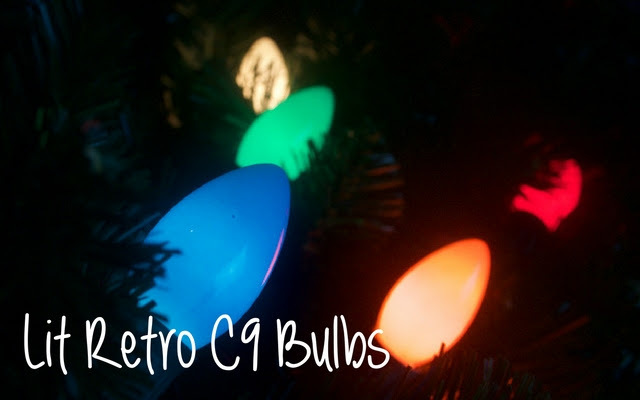 They don’t look exactly like traditional C9 bulbs but they are a nice compromise. From Tyler. He didn’t purchase his lights from us but I’m glad we could give a hand! This might be a dumb question but I plugged all my lights into one series, 9 strands of lights. They were all lit for a minute and then went out. Upon reading my box it says not to plug in more than 3 strands in a single series. Are all the lights shot for good? I tried just plugging in one or 2 and I cannot get them to turn on? Any advice or help would be great. Yes, you could have smoked them. But, you may have just blown a fuse in the male plug ends of one or more of your strings of lights. Open the little doors in each of the plugs and check the fuses. Hopefully, that solves the problem. 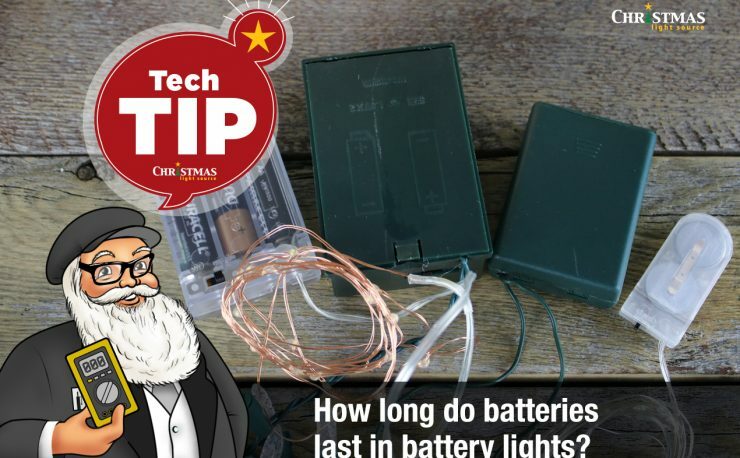 How many lights you can run in series is dependent on the gauge wiring and rating of the bulbs so it will change for different strings of lights. If changing the fuses does not restore the lights, you may have damaged the wiring in which case, you may need to start again with new lights. Thank you! It was just the fuse. Regarding how many lights you can run in series: Tyler’s lights must have been an older style or were made with thinner gauge wire. Most online vendors are selling incandescent mini lights that can per run per UL (Underwriters Laboratory) up to 210 watts in series. That translates roughly to 5 strings of 100-lights or 10 strings of 50-lights. Be sure to follow the manufacturer rating on your strings since there are all sorts of factors that play into that rating. 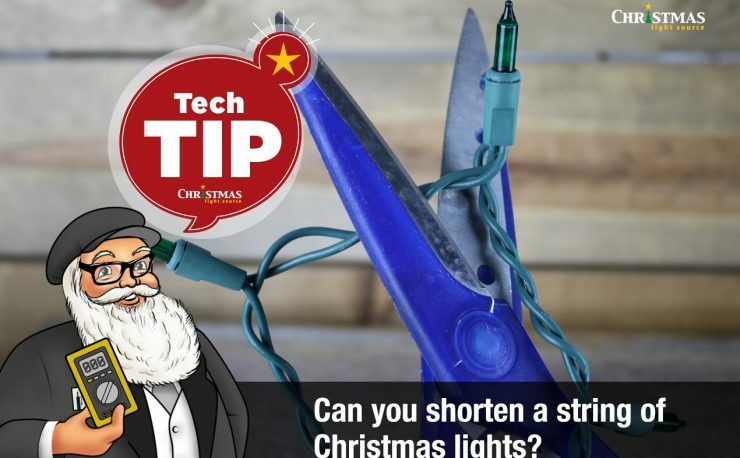 Keep in mind if you need to run more lights in series, LED Christmas light strings can run anywhere from 27 to over 80 strings in series. I was looking to use an LED mini light strand to create a wine bottle lamp with night-light using a 2-circuit switch, a light bulb up top and the string lights in the bottle below. This setup would have me removing the male end of the LED string lights to connect with the switch. After noticing the fuses located in the male end, I’m concerned this could be a bad idea. Do you have any thoughts on the safety of bypassing the male plug end? Is there another way to incorporate the fuses not using the male end? Thanks and Merry Christmas! We actually don’t suggest you modify the LED craft lights – it violates the UL, voids their warranty and will significantly reduce the lifespan of the LED lights if they work at all after the modification. You’d also be bypassing the inline rectifier in this scenario. 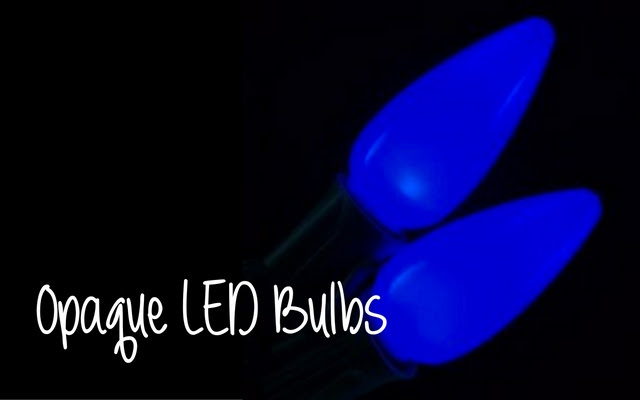 As an alternative, plug your string of lights into an inline switch that you can more than likely find locally. As far as I know, a fuse installed in the plug end is standard for Christmas lights. I don’t know of an alternative.